Widowed at 35 following her spouse’s death from Lou Gehrig’s Disease (ALS), and after surviving a near-fatal suicide attempt, Terry Wise spent the next several years in treatment. A former Boston trial attorney, Wise has since devoted her life to international public speaking and full-time writing. She has traveled to all 50 states and hundreds of cities to appear as a keynote speaker, continuing education instructor and workshop presenter—speaking to both the general public and professionals on topics related to depression, grief, long-term caregiving, suicide prevention, and the process of recovery. 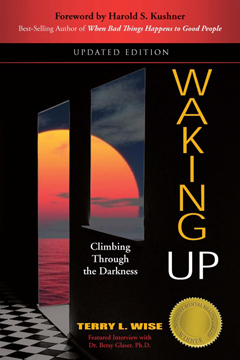 Wise is the author of Waking Up: Climbing Through the Darkness with a foreword by Rabbi Harold S. Kushner, best-selling author of When Bad Things Happen to Good People. Wise’s highly-acclaimed book provides a roadmap for the restoration of emotional health. Waking Up is in use at numerous universities nationwide, including Columbia, Rutgers, Simmons, Loyola, Northeastern, Gonzaga, Aurora, St. Mary’s and Sacramento State and it has been endorsed by prominent experts in related fields. Waking Up has also been adopted for use in crisis centers and in the training materials for the Core Competency Curriculum developed by the American Association of Suicidology and Suicide Prevention Resource Center (SPRC). Wise has served on the boards and steering committees of numerous national organizations, including the National Suicide Prevention Lifeline (NSLP) 800-273-TALK, American Association of Suicidology, Families for Depression Awareness, Suicide Prevention Resource Center (SPRC), and the Public Awareness Task Force for the National Action Alliance for Suicide Prevention (launched by the U.S. Health & Human Services Secretary and the Defense Secretary). She is also a member of the Speakers’ Bureau for the Depression and Bipolar Support Alliance. Terry’s work as a public speaker and author is featured on a nationally distributed educational video. This video was the winner of the 16th Annual National Health Information Awards. It was created and sponsored by the National Suicide Prevention Lifeline (NSPL) and the U.S. Department of Health and Human Services/Substance Abuse & Mental Health Services Administration (SAMHSA). Wise is also a featured interview on two of WebMD.com’s “Depression Insights” Video Series (to view videos, click on “Insights” on the left side of this link and select “Major Life Events“ and “Suicide“). In addition, she is a featured expert on a nationally broadcast Radio Podcast, Diagnosis and Treatment, sponsored by Families for Depression Awareness. Terry is the Founder and President of The Missing Peace Foundation, a non-profit organization that provides financial assistance, public speaking and other resources to entities that lack funding to advance their efforts to help those confronted with mental and physical health issues. Qualifying recipients include organizations, communities, schools and other associations who aspire to raise awareness and educate others on topics related to long-term caregiving, grief, depression, mental health, suicide prevention, and the process of recovery. Please visit www.TerryWise.com/Foundation for more information about the application process. Expounding upon a rare combination of personal experiences, Wise invites audiences behind the closed doors of a therapy office. Speaking from the rarely-heard perspective of the patient, she reveals powerful insights about the entire process of recovery—for listeners who sit on both sides of the couch. Whether it is to provide an inspirational message, augment the skills of health professionals, or help others navigate the road to emotional health, Wise equips her audiences with coping skills, pragmatic tools, and a gripping story of hope and personal triumph. In addition to conducting hundreds of full-day continuing education seminars for a diversity of helping professionals, Wise’s other appearances and previous keynote speeches include multiple Veteran’s Affairs Medical Centers, U.S. Navy Pacific Fleet in both Guam and Pearl Harbor, U.S. Army at Rock Island Arsenal – Training for U.S. & Deployed Troops, National Guard Assn of Louisiana, Columbia University, Wellesley College, National Alliance on Mental Illness (NAMI), Medtronic, Inc. Employee Assistance Program (EAP), Canadian Mental Health Assn of Nova Scotia, Captain James A. Lovell Federal Health Care Center Veterans Administration, Psychiatric & Neurologic Pharmacists Annual Conference, Alaska National Tribe Health Coalition, Memorial Sloan-Kettering Cancer Center, American Psychiatric Nurses’s Assn, MDA of Hawaii, National Center for Death Education, Canadian Assn for Suicide Prevention, Council of Nephrology Social Workers of Maryland, The Menninger Clinic – International Psychiatric Center, National ALS Assn, Simmons College, University of Wisconsin, American Assn of Suicidology, Harvard Medical School Psychiatric Facility at McLean Hospital, Assn for Death Education and Counseling (ADEC), Foundation for Sudden Infant Death Syndrome (SIDS), Partnership to Prevent Child Sexual Abuse, Depression and Bipolar Support Alliance, The International Alliance of MND Associations, Midwest Neurological Disorders Agencies Coalition (Alzheimer’s, Stroke, Parkinson’s, ALS, MS, Epilepsy, Brain Injury, Essential Tremor), as well as chaplaincy programs, universities and community awareness events.